We’re in Los Angeles on home leave, and my mother and two of my many aunts are perched on my grandmother’s sofa in a prelude to an evening out with my father and uncles. A gaggle of us cousins will stay at home with our grandparents and maybe watch some TV, a program that pleases the tired old folks as they eat their evening bowl of corn flakes: Thunderbirds Roller Derby, or All-Star Wrestling, or maybe Divorce Court. If we’re really lucky, it will be Bowling for Dollars, which we kids think is a very good show. 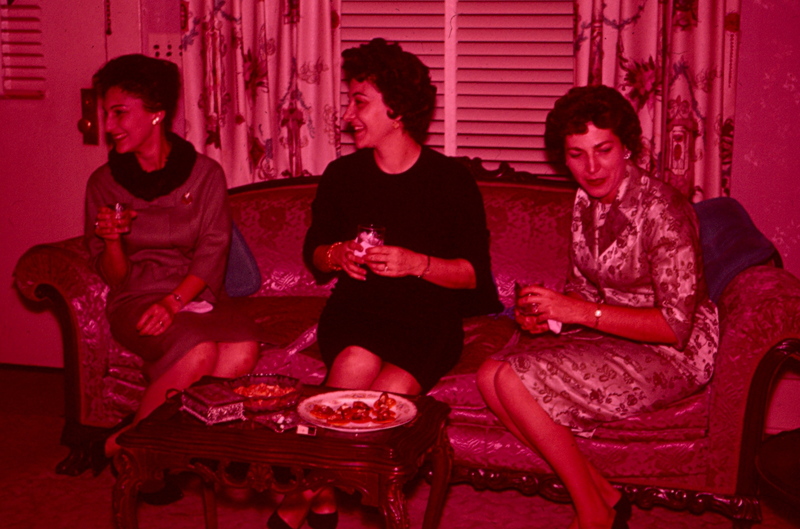 As they sip their drinks, the aunts aren’t looking at the hors d’oeuvres on the small cocktail table in front of them: salted mixed nuts and a half-eaten plate of smoked oysters on Ritz crackers. In my father’s profession, the cocktail party was as much a workplace as the Embassy office. At these frequent gatherings, foreign diplomats and domestic muckamucks rubbed elbows, shook hands and kissed air while discussing a lot of important stuff. Dry martinis, which I could expertly shake or stir, pour and serve by the time I was 8, washed down the cocktail party fare comprising many tasty things from cans and jars: Vienna sausages on toothpicks; celery sticks with pimento cheese; Spam and sweet pickles on toast; white asparagus and red peppers rolled in squishy white bread; salted mixed nuts; and the ubiquitous “smoked oysters.” These came in rectangular tins whose lids had to be uncurled with a special key or wrestled open with a manual can opener; the kind that you had to stab into the top and seesaw up and down along the rim creating a viciously jagged edge on which to slice your fingers to ribbons. For large cocktail parties, several hundred reeking oysters had to be dumped out of their tins, drained of their fishy brown oil, plopped dead center onto Ritz crackers and appetizingly arranged on shiny silver platters. The maids lassoed into this detail prayed for deliverance as they pinned clothespins to their noses and bent to their odious task. Mom and Dad were fresh from their last posting and I’m pretty sure the smoked oysters on the cocktail table were my mother’s idea. After our parents left the house, maybe we cousins drained the dregs of the cocktail glasses, gagged down the last of the smoked oysters, and instead of watching Bowling for Dollars, had fun jumping to the bottom of the stairs from the second story landing. We would do that a lot until my grandfather yelled at us. Swear to God, that’s MY life you’re remembering! Damn, I miss those days for some reason. We did live the same life…and I’m pretty sure you jumped down the stairs with me more than once! Yes yes yes I did!